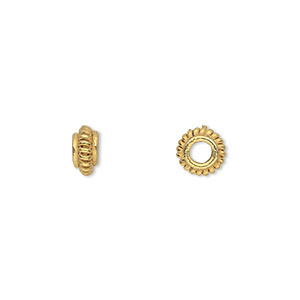 Bead, 14Kt gold-filled, 4x2mm corrugated rondelle. Sold per pkg of 4. Item Number: H20-A2686MB Have a question about this item? 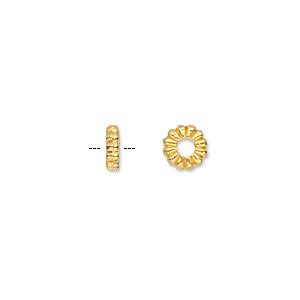 Gold-filled corrugated rondelle beads bridge the gap between gold-plated and 14Kt gold. Gold-filled items are made by combining a layer, or layers, of gold alloy to a base metal, then rolling or drawing the metal to the desired thickness and shape. It has a long life and can be worn by most people without allergic reactions. 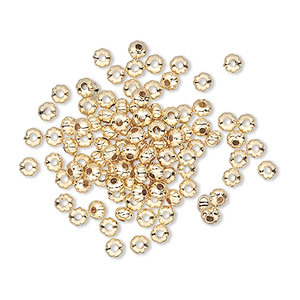 Bead, 14Kt gold-filled, 4x2mm corrugated rondelle. Sold per pkg of 20. 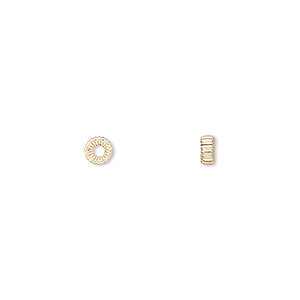 Bead, 14Kt gold-filled, 7x4mm corrugated rondelle. Sold per pkg of 4. Bead, gold-plated brass, 3x2mm corrugated rondelle. Sold per pkg of 100. 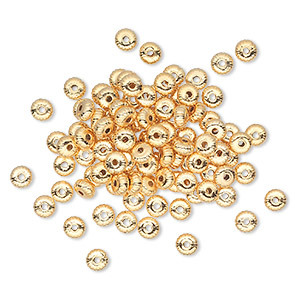 Bead, gold-plated brass, 4.5x2.5mm corrugated rondelle. Sold per pkg of 100. 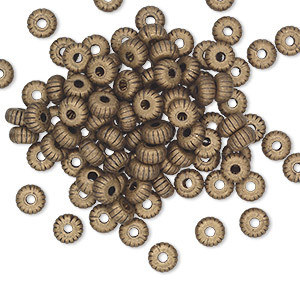 Bead, gold-finished copper, 7x4mm corrugated rondelle with 3mm hole. Sold per pkg of 20. Bead, antique gold-finished "pewter" (zinc-based alloy), 9x2mm corrugated rondelle with 4mm hole. Sold per pkg of 20.